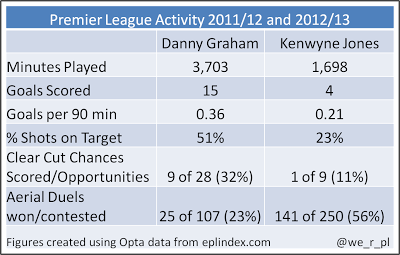 With all the rumours going round about bids coming in for Danny Graham and possible rejected bids for Kenwyne Jones, I've decided to have a look at their comparative stats. I've looked at Premier League games since the start of last season to hopefully give a long enough window for a fair comparison. When comparing across teams, it's always worth bearing in mind the relative styles of the teams (e.g., Stoke generally don't score many and have a lot more aerial duels) but the figures suggest Graham scoring at a rate of around 1 in 3 full games and Jones around 1 in 5. For shots on target, Graham's figure is far higher (51% v 23%) and almost half (23/47) of Kenwyne Jones' shots end up off target so it's not just a case of lots of goalmouth scrambles with shots getting blocked. For Clear Cut Chances (e.g., where a player is through on goal has a 'reasonable' expectation of scoring), Graham is far ahead but is a long way behind Michu's figures of 9 goals from 15 clear cut chances in the league this season. Some chances are more clear cut than others of course, a tap in is easier than a one-on-one as well as taking the 'You've got to be there to score them' argument into consideration. 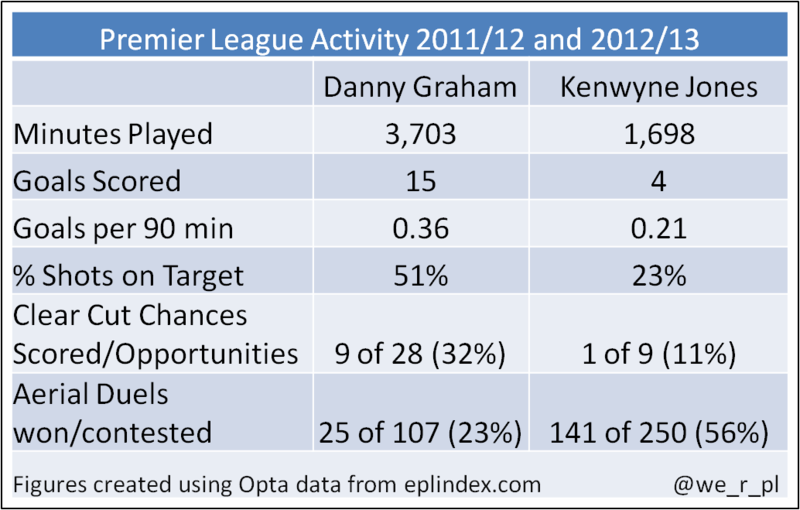 The most obvious thing in Kenwyne Jones' favour is the huge difference in Aerial Duels won (56% compared with 23% for Graham), this is made an even bigger factor when you consider that Michu has had 140 aerial duels in the league this season (winning 49%) already far more than any player had across the whole of last season (Ashley Williams with 107). The first thing you naturally look for in a striker is goals, but with a more direct approach this season, having a player who can hold the ball up and battle in the air could be an interesting addition, whatever the reasons for a possible change in striker. To be fair to Jones, just looking at this season's stats, he has 3 league goals in 723 minutes compared to Graham with 3 in 858 so it's not a completely cut and dried case and he went to Stoke for £8m so there must be something there.